The formation of diamonds is to look into the past of the world itself, as it takes millions of years for a diamond to form, deep below the Earth. Intense pressure and various other geomorphic conditions combine to create a diamond. In essence, the diamond jewellery we wear takes an incredible journey that eventually, makes its way to the distinctive jewellery created by Shimansky. Diamonds are considered the world’s oldest treasure, having formed over 3.3 billion years ago, 200km below the Earths surface. Under conditions of intense heat (900 to 1,300 degrees Celsius) and pressure (between 45 and 60 kilobars), carbon atoms crystallise, forming diamonds. It takes millions of years for a diamond to form, and geologists believe the most recently formed diamonds may be up to 45 million years old. Variations of temperature and pressure can significantly impact the formation of diamonds, and if the conditions are not ideal, it could result in the dissolution of diamonds. Molten kimberlite (also known as magma) are also formed within the Earths upper mantle under conditions of intense heat and pressure causing it to expand at a rapid rate. This expansion causes the magma to erupt, forcing it into the Earth’s surface and taking along with it the diamond-bearing rocks. These types of “eruptions” have not occurred in recent times, and it is believed that they happened during a time when the Earth was naturally hotter, thus making such eruptions more likely. Traveling at an incredible speed, the erupted magma forms a pipe to the surface of the Earth. As the magma cools, it hardens to form a rock called Kimberlite, the most significant source of diamonds. The Kimberlite settles in vertical structures known as Kimberlite pipes. Kimberlite derives its name from the town of Kimberley in South Africa, where the first diamonds were found in this type of rock. Though Kimberlite pipes are the most significant source of diamonds, it is estimated that only 1 in 200 Kimberlite pipes contain gem-quality diamonds. This is testimony to the rarity of diamonds, and serves as a reminder that a diamond is a unique gift from Mother Nature, unrushed in its formation, and extremely valuable due to its scarcity. Diamonds are mined by means of various techniques, and on average, 250 tonnes of ore is mined to produce a one carat gem-quality polished diamond. The Ancient Greeks believed that diamonds were tears from the gods, and that they had mystical and magical properties. Though the perception of diamonds has changed somewhat since then, these precious stones have retained their ability to fascinate all who look at them. With an expert level of skill the Shimansky diamond cutters and polishers bring a rough diamond to life and showcase its brilliance, fire and scintillation – and most importantly to reach its full potential. The word “diamond” comes from the Greek word “Adamas,” meaning “indestructible.” The strongest material known to man, a diamond consists purely of carbon, making it the only gem comprising of a single element (it consists of 99.95% carbon). The remaining 0.5% is believed to consist of trace elements, which can have an effect on the colour of a diamond, but are not a part of its chemical structure or molecular make-up. Found in abundance, carbon takes on many forms: the difference between a diamond and a lump of coal, is essentially their molecular structures. Coal or charcoal has an amorphous structure, and contains organic molecules of decomposed plant and animal matter. Like diamonds, it was also formed deep within the Earth’s crust. Diamonds, however, have a crystalline structure, which resembles the shape of a pyramid. When a diamond is formed, each of its carbon atoms bonds with another four carbon atoms. This means that each atom is essentially participating in four extremely strong covalent bonds. 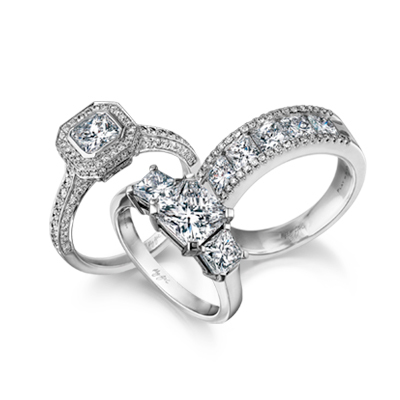 It is as a result of these bonds that diamonds are 58 times harder than any other matter found in nature. Found in various parts of the world, diamonds are most abundant in Africa, South America and parts of the East. The first diamonds are believed to have been discovered in the rivers and streams of India in as early as the 4th century BC. Brazil became an important diamond source in the 1700s, and it was only in 1867 that diamonds were discovered in Kimberley, South Africa. Today, South Africa is one of the world’s most well-known and bountiful diamond-producing countries. Shimansky’s expert team can see a diamond’s potential while it is still in its rough form. It takes great precision, skill and attention to detail from our master diamond cutters and polishers for the rough stone to be transformed into a mesmerizing display of light in a jewellery creation. Beautiful and rare, a diamond’s unique journey of formation gives it its unique qualities, as well as its ability to shine with unrivaled brilliance. The most precious gem of all, a diamond’s journey from the core of the Earth, to the finger of the one it was meant for, is not only fascinating, but magical.